A while back Vlait made a mention of a Robotron game in this post so I decided to grab the source code mentioned and try and bring it up on my Pipistrello board because of the memory requirements of the game currently 49 RAMB. 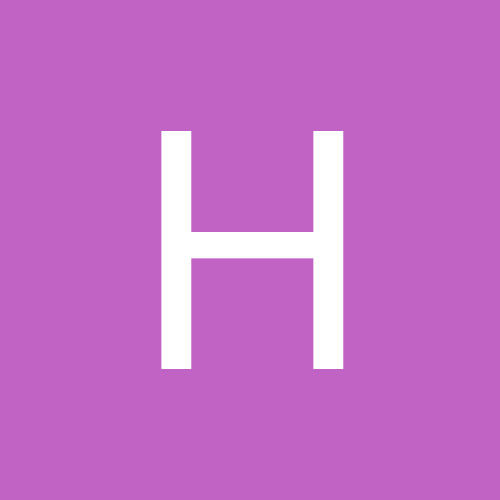 I encourage you to read the wiki of the original author, Jared Boone, but as a quick recap, his implementation uses a real 6809 CPU connected to the FPGA board. Because the real Robotron uses in fact two 6809 CPUs, one for the sound and one for the game, and Jared could only connect just one physical CPU to his FPGA board, he has a split project where he can test either the game or the sound but can't have a complete game with sound running all at the same time. As Vlait said, there is now an Opencores implementation of a 6809 so it should be possible to do away with the physical 6809 CPU and implement the entire game on one FPGA, complete with sound. I grabbed the Opencores 6809 and and quickly made a top level module connecting all the components together, should be a piece of cake bringing this to life, right? Well... no, actually. This is a side effect of the memory test filling the entire RAM including the video buffer with pseudo-random data, but my board produced... a black screen. On to the simulator we go, fire up Isim and start a simulation, while in parallel run MAME in debug mode to bring up the game disassembly and single step and compare the two. Immediately apparent was that the soft CPU failed to fetch the reset vector and was executing garbage. This turned out to be due to slight timing differences between the real CPU and the soft CPU so I had to delay the latching of the CPU signals by a few ns. As soon as I did that I got the rainbow noise just like the real game which was promising but immediately after that, the screen would turn black and remain so indefinitely, whereas the real game would post a message "Initial tests indicates: operational" and proceed to the attract screen. What could be wrong, I wondered? Back to Isim. It turns out that the memory test takes a significant amount of time, about 5 seconds in real time, and since I know that works fine given the screen output and that the problem occurs after that, there is no point trying to simulate 5 seconds of real time which would take a very long time to simulate, and probably fail because Isim can only store so much signal data in its database before it throws up its hands and stops due to it having reached its limits. So the easiest thing to do turned out to be to patch memory locations F46B through F47B inclusive, with no-op type instructions such as LDX #$0000 (three byte) or LDY #$0000 (four byte). After this, the game happily skipped through the time consuming parts to quickly move to the problem area at about 70ms after reset. The simulator shows that the CPU address freezes and this is of course due to the halt signal being asserted. So the last instruction actually executed was that at 6004, storing the A register at address CA00, which according to MAME source code from williams.c is the "start blitter" address. So basically, as soon as the blitter is accessed, it halts the CPU to gain the bus, but for some reason the CPU remains halted indefinitely. Why would that be I wonder? Well it turns out that the real CPU is meant to acknowledge certain events such as IRQ, fast IRQ, Sync, Reset and Halt as well, by posting certain levels on output pins BA ("bus available") and BS (bullsh... err, I mean "bus status"). But the Opencores 6809 does not implement those signals at all, so there's the problem. Enough debugging for today though, it's 1:30am, yawn... next I'll need to add the sound CPU to the project, not sure how it connects to the rest, will have to consult the schematics. Great write-up - I see I will need to buy a second arcade joystick from Sparkfun! So it turns out I was wrong when I said above that the Robotron uses two 6809 CPUs and that this is the reason why Jared split the project into two separate projects. This was an assumption on my part. On closer inspection, the game uses a 6809 CPU for which Jared chose to use a real CPU and the audio board uses a 6808 for which he used a soft core. I guess he's still working on this project and split it in two so he can throubleshoot each section individually. Would completing this also unlock the other Williams games of the era, which look to be on more or less the same hardware, control schemes aside? Defender, Joust, Sinistar all start up with that rainbow visual noise memory test and pinball-esque sound effects suggesting they're reusing routines from each other, so I'd be surprised if the hardware platforms are much different. it's no small feat getting something even closely resembling the original picture on the screen. 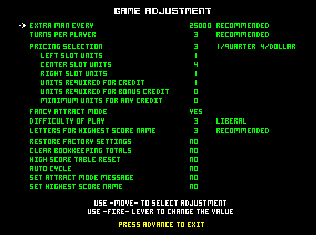 RorscachUK: yes, almost all of them should - Joust, Robotron and Bubbles are more or less the same hardware. Splat is a bit of a mystery to me, never seen a board or looked at mame source but it should be *almost* the same as the above. is a little less complicated. Haha you're very kind, but my contribution is small, I'm just porting Jared's work to a new platform as well as using a ready made core to replace the CPU so it all fits in the FPGA. Hopefully if I have enough time I'll be able to integrate the sound in and get a few other games running on the Williams hardware. The real fun for me is not having everything work first time. Debugging and troubleshooting the digital logic, writing test benches and running simulations is quite cool IMO. One thing I did was rig up the sound section as a standalone project to a top level module that allowed me to use a PS2 keyboard to send custom values to the input of the sound module. Every time a coin is inserted into the Robotron game, it makes a different sound out of several choices, seemingly picked at random. This is great because it would let me test different sounds. The line in red is our breakpoint and it just initializes the stack, then the next line reads memory address $402, which happens to be the PIA port that connects to the main game CPU board. In this particular case the value it read was $F3 as can be seen in the register section. By obtaining this and other values in this way and sending them to the FPGA through the keyboard I was able to compare that the sound generated by MAME matched in fact the sound I was getting from the FPGA. This was very encouraging as this was not just a simulation, but actually running on the FPGA making real sounds. I thought this would now be a breeze to get going, so I hooked up the sound section to the rest of the game. As per the schematic, the game's ROM PIA port B low 6 bits plus the PA7 line go to the sound section's PIA port B. There is a little trickiness there because the PIA port pins have external pullups, so when the port pins are set to be inputs, the resistors pull the lines high. This has to be accounted for by also considering the PIA's data direction register. Anyway, long story short, hooked everything up and of course it didn't work, no sounds came out at all. At this point I got majorly sidetracked as I realized I never really attempted to start and play a single game. I didn't expect much since as I said in my original post, I could see some of the graphics looked a little corrupt but I thought I'd just see what happens. So I hit the coin insert button and nothing happened this is getting to be a theme here! Looking through the code and hooking the game button inputs to some debug LEDs showed some of the buttons were being doubly inverted ending up with the wrong polarity. After fixing these and firing up the game on the FPGA again, this time the screen was not progressing to the game attract (demo) screen but would get stuck at an ominous looking message. Pressing the advance button would then go past this to the familiar attract screen, however pushing the coin buttons still would not increment the credit so I could not start a game. It turns out that when the buttons were doubly inverted this had the effect of the advance button being constantly pressed causing the game to quickly skip past this CMOS error into the attract screen so I never got to see it, but now that the buttons were fixed, I could clearly see there was a problem. It instead showed all the values as zero. This immediately made sense to me. Since the price selection coin slot units were zero (because of the CMOS failure), every time I pressed the coin insert button it would add zero credits and without credit, I couldn't start a game. That seemed like it would quickly become annoying, so I fixed it by adding initialization values to that section of the BRAM, similar to how we initialize the game ROMs, with values I obtained from dumping that section of memory from MAME with the command "save CMOS.BIN,CC00,400"
At this point it's back to the simulator to track down the issue. My gut feel tells me it's a blitter issue, or a subtle timing issue or both. Remember, Jared used a real 6809 CPU whereas this game now runs a softcore 6809. Great progress! I'd wondered if the first power-on CMOS settings would be a problem, in MAME the first time you start a Williams game it makes you go through all that factory settings press advance nonsense, but saves it into some sort of non-volatile CMOS memory and boots properly afterwards. Grabbing a snapshot of already-setup values sounds easier than reimplementing saving to CMOS with FLASH or EEPROM or something. Oh and just in case any observers are thinking that bottom screenshot shows horrible corrupted graphics, that's just what Robotron does normally when a level starts! In order to troubleshoot the game freezing issue I need to simulate the problem so again the challenge here is to quickly make the game skip to the problem area so I don't have to spend endless time simulating things that work just fine. In my first post I showed one way to patch the game to skip the lengthy initialization, but a little more time with the debugger reveals a slightly better patch. The game initialization section seems to be fairly separate from the rest of the game and when it finishes it jumps to the game start section at address $D106. 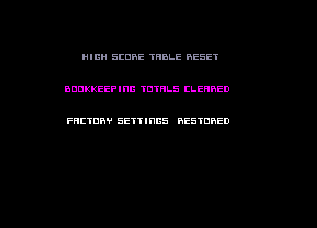 All I had to do is change the reset vector to just point to $D106 and the game happily just starts into the attract screen skipping over several seconds of RAM and other hardware tests. But this is still not far enough into the game, for example, the picture below shows a side by side comparison of a good video frame (left) from MAME and a corrupt screen from the FPGA (right). The game reaches $D17A and "jumps to a subroutine". Anyone who knows even a little assembly language expects that the code will return from the subroutine and continue execution at $D17D however you'd be wrong. 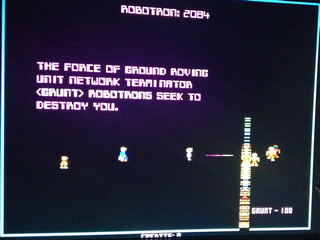 The Robotron code is full of these little nasty surprises. The subroutine jumped to goes and does some magic like pulling the return address ($D17D) from the stack, retrieving the data there ($77A0) into register X then adjusting the return address on the stack to point to $D17F before returning. It turns out that $77A0 is used as a jump address to the first demo screen. By continuing to run the game code with suitable breakpoints I finally find out that the demo screen I want has an address of $77EF so by patching location $D17D to contain $77EF and in conjunction with the other reset vector patch to $D106 the game now powers on and almost immediately goes to the problem area. The game is now suitably patched for simulation. When doing simulation troubleshooting, the waveform view in the simulator is great for zooming into and focusing on a spot once I know where the problem is, but when I zoom out to get a global view, everything just looks the same, so I need to use other tricks here. One such trick is to output data from simulation into one or more files. Since I spend a lot of time bringing old arcade games to life, one of the more useful modules I built a long time ago takes a video signal input (RGB values and H/V sync) and writes that out into a PBM (portable bitmap) file. As the simulation runs, a new sequentially numbered file is created for every complete frame of video allowing me to easily view the files and with a flick of the scroll wheel, quickly scroll through them if I need to see an impromptu animation of the video frames. Additional to that, I log other interesting data to another log file. Such data can be register contents, signal values, timestamps, or anything of interest. The simulation can then run while I do something else and I end up with a nice log of all the data I need, allowing me to quickly find points of interest in the simulation that I can zoom into. Before I focus specifically on why the game just freezes at the start of a level, I wanted to find out why the blitter produces corrupt graphics. I have a feeling these are related issues and even if they aren't related, the blitter issue still has to be resolved anyway. The thing that is puzzling me is that the blitter is pretty much used to build everything on the screen, from drawing text, to animating those round multicolored Williams logos (the solid circles with W inside them) that rotate around the outside border of the screen, to also building the large Robotron logo in the center of the screen. So why would the blitter work for some things and not other? As a quick intro to the blitter, it's a special chip with 8 registers mapped to addresses $CA00-$CA07, that is programmed by the CPU to do certain things, mainly move data around the memory like a sort of DMA. The registers are typically programmed with a source and destination address, the length of data as a width and height, the type of operation to perform and some attributes. When the CPU writes to the address $CA00 the blitter is activated and asserts HALT. This causes the CPU to freeze so the blitter can take over the data/address bus to perform its operations, then when it is finished, it releases the CPU from HALT and the blitter goes back to idle while the CPU takes charge of the buses again. These register values now agree 100% with what I observed in MAME debugger. Feeling confident, I run the new code on the FPGA and... you guessed it, it made absolutely no difference. If you didn't guess it, you must not have read my previous posts, failure it seems is the usual outcome The problem demo screen still has the problem, so I spend a fair amount of time troubleshooting and finding an issue that turned out to not have a bearing on the actual observed problem! By continuing to compare the blitter register from simulation with those from MAME only about 20 lines later, I come across another difference, this time it seems to be in the blitter register 5 which is part of the destination address. Bingo! This looks important. The highlighted line in the text editor behind the debugger doesn't match with the register contents as displayed in the MAME memory window at the top. After zooming into the relevant point in the simulation waveform, it turns out that this specific issue happens when the CPU is halted in the middle of an ADDA (add a value to Accumulator) instruction. The CPU enters the HALT state with the register A set to a specific value, then when it exits the HALT state, the A register changes value just before the ADDA instruction is executed. This causes A to have an incorrect value the next time it is used to write to the blitter register, hence the incorrect blitter behavior. This is clearly a problem with the softcore 6800 so I went back to basics and created a testbench with just the 6800 core and a tiny memory space of 64 bytes. This way I could test what is going on isolating the 6800 and having complete control over it. This is the memory I used in the test bench mapped to the top of the memory space, it sets up the required vectors so the CPU comes out of reset and jumps to the code that initializes the CPU registers with some known values. This shows a simulation of the above code without halting the CPU. The attached pictures are only a small view into the CPU internal workings and the cause of this error is not visible in these pictures, but further investigation shows that the A register is overwritten because acca_ctrl, the state that controls operation on A, transitions into the wrong state at the end of a HALT cycle. Instead of remaining in latch_acca which maintains the A register contents it transitions into load_acca causing the A register to load the value output by the ALU, $CC in this case. Simulation now shows the problem is fixed so the next step is to test this on actual hardware and for a change, the outcome this time is no longer failure but sweet, sweet success. The Robotron logo now builds perfectly and more importantly, the freeze at the start of a game level is now completely gone. The game seems to me to work perfectly but with no sound (still working on that). -Joust crashes ingame too (had time to play until the end of 3rd level, looked like a paging problem), also is a lot happier with a clean sram image. -robotron does have the occasional graphic glitch - could not tell if because of blitter or cpu, would blame cpu for the moment. Thanks, as I said I do enjoy the debugging process. it's like solving a puzzle. I'm still working on the sound which is such a pain because it looks like it should be so easy to get going but it just refuses to work. Continuing the debugging into why the sound doesn't work, I took a look at the 6821 PIA since I feel that it is the key to this issue. The main board PIA interfaces to the sound board PIA to activate each sound. One thing I noticed a while ago is that in this VHDL implementation of Robotron, the sound section uses pia6821.vhd which is written by John Kent but the main board ROM and Widget PIAs use mc6821.vhd which according to the credits is written by Jared. I could not explain why this project uses two different implementations of the PIA and without asking Jared, I'd only be guessing. I took a look at the implementation of both and it seemed to me that Jared's implementation was less complete that John Kent's. This is based on a number of things such as TODO comments, some left over code that has no functional effect (first process titled "Effects of register reads") and a bug that I came across while analyzing the code in mc6821.vhd. When analyzing the VHDL code, the four processes under section "Interrupt edge detection" I noticed that IRQA was indeed cleared when reading from address rs="00" but IRQB was also cleared from rs="00" when in fact it should be rs="10". After correcting this bug I run it in the FPGA and I noticed that something was off. While everything seemed mostly OK, the distinctive Robotron color palette animations were missing. Instead of the flashy changing colors on most of the demo screens, the colors were static. What the...? This sent me into another troubleshooting session to find the root cause of this peculiar effect. It's obvious from the code that the first thing the ISR does is clear the interrupt by reading the ROM PIA output register B at $C80E (last two address bits are "10"). The effect of this should be that the IRQB line from the ROM PIA should immediately go low (deasserted). Bear in mind that the way the 6809 CPU works is by having a level sensitive IRQ pin, this means the IRQ is not triggered by a transition on the IRQ pin, but simply by the pin being asserted. This means that as long as the IRQ pin to the CPU remains high, the ISR handler will be repeatedly triggered. The CPU has an internal flag so that while it is executing an ISR, interrupts are disabled, this prevents an ISR being interrupted from finishing by another interrupt (at the same priority level) causing it to get stuck. As soon as the ISR routine ends and the RTI instruction is executed, the interrupt disable flag in the CPU is automatically cleared allowing the CPU to recognize interrupts again. 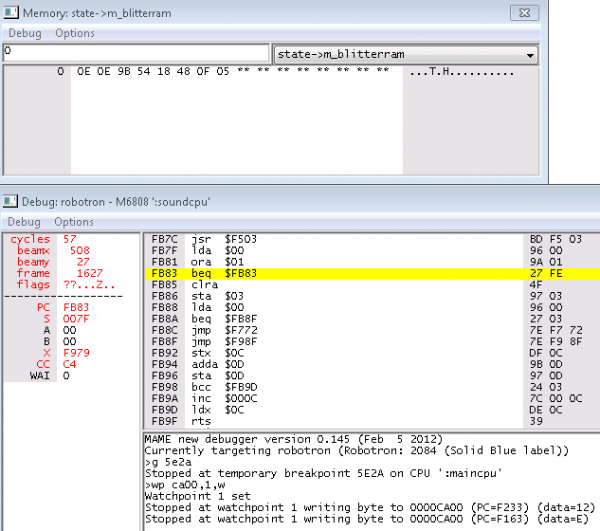 If the IRQ pin is still asserted at that point in time, the CPU interrupts again and executes the ISR. This is exactly what is happening here!!! From the simulation screen above we see the behavior of the original code before fixing the bug. The ROM PIA is fed a irq_4ms signal which is a square wave with a 4ms period and on every high to low transition of this signal an interrupt is generated on the IRQB line which ends up interrupting the CPU. Notice the IRQ line to the CPU remains asserted for a very long time and the CPU ends up executing numerous interrupts repeatedly. This is obvious by looking at the bs line, every time it goes high (notice how many times it does that), the CPU acknowledges the interrupt and if we were to zoom in all the way we could see the CPU's program counter and see it executing instructions inside the ISR. The CPU ISR clears the interrupt on the ROM PIA with no effect, then finishes the ISR and exits only to be triggered again because the interrupt line is still asserted. If the ISR had a purely static behavior, the CPU would be stuck in this interrupt hell forever, however the ISR is influenced by external events. 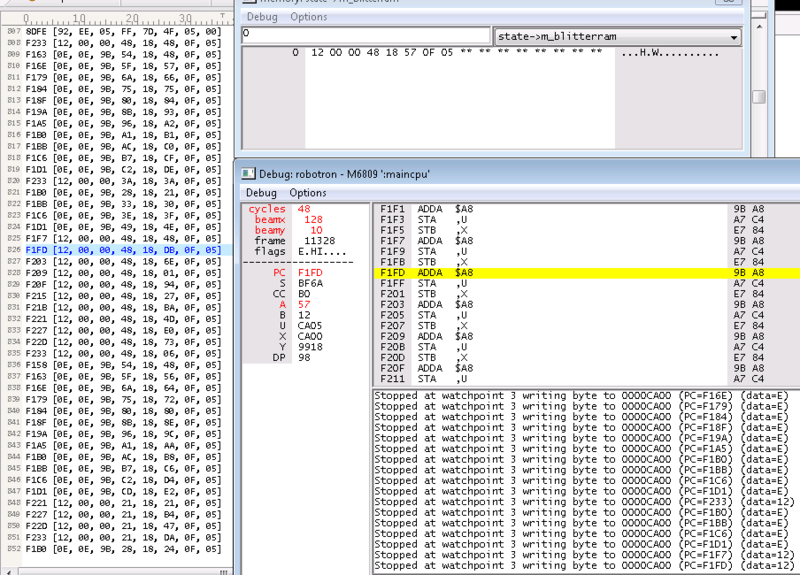 One of these is the video counter at address $CB00, see the disassembly above. When the counter has certain values the ISR execution is affected causing it to execute different code paths. One of these eventually performs a read from address $C80C clearing IRQA (which isn't triggered) but also due to the bug, clearing IRQB releasing the CPU from the endless interrupt it was stuck in. So now you may be wondering, just like I did, why would this buggy behavior actually seemingly produce a working Robotron game, while fixing the bug actually stops the game from running as intended (color cycling is gone)? The simulation above shows the buggy PIA replaced with John Kent's PIA implementation, showing correct interrupt response and clearing. The interrupt pulses are short and the IRQ line is cleared (deasserted) as soon as the ISR is executed. 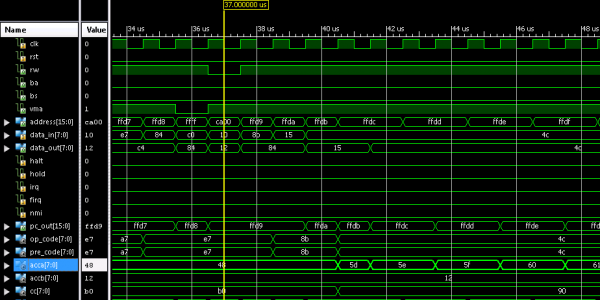 In case you're wondering, the large portion of time the IRQ line is high as the start of the trace above, is the power on initialization of the CPU and there are no interrupts being handled as can be seen by the bs line remaining low. So what is the root of the problem? The video address value is obtained from a video counter. Currently irq_4ms is simply tied to the counter like this: "irq_4ms <= video_count(11)" and looking at the schematic this appears on the surface to be correct, but in fact is not. The irq_4ms is meant to be tied to video address line 11 (in schematic labeled as VA11 ) and if we in fact look at that signal in the simulation we can see it perfectly lines up with the counter value we want as well as all the others so the intended VHDL was in fact "irq_4ms <= video_address(11)", see picture above, where the falling edge of irq_4ms now lines up with the correct counter values as well as generating interrupts at the correct time. This is another view after zooming in further and can clearly now see that the IRQ line is asserted while the video counter value just changes to $00. Be aware that on interrupt the CPU has to push its registers on the stack and it is about 34 clock cycles later that it actually reads the video counter, so the fact that the IRQ line is asserted just shortly after the video counter has changed is not causing any timing issues. The proof is always in the pudding as they say, so running this new updated and fixed code on the FPGA shows correct color cycling operation. So why did the buggy one work too? Well it's because the interrupts were asserted for such a long time and executed continuously for long periods of time that sooner or later, the ISR was executed at the right time by pure accident. This is like carpet bombing an entire city just so you can hit one house... It's also possible that because the CPU spent such a long time repeatedly running the ISR it left less time for running game code possibly slowing it up or altering game play, though a cursory look over the game execution did not show that to be an obvious problem. Yeah, this forum's account was temporarily suspended so I couldn't post, but yeah, finally sound is now working! It's worth noting here that I expected as soon as I reset the game to hear a continuous sound like I hear when I start the MAME game. This sound persists the entire few seconds while the RAM is being tested and the screen displays the rainbow noise, but on the FPGA I wasn't hearing that. I immediately assumed there was a fault so I started a new simulation with the relevant signals (game CPU, ROM PIA, sound CPU, sound PIA). While the simulation was running (takes a good 20 min) I decided to browse through youtube videos of Robotrons. Mostly they are all videos of MAME gameplay and very few are of the actual hardware running the game. Even when finding real hardware, the video is mostly of gameplay but not the actual power on sequence which is what I was interested in. Finally after much hunting around I found this video showing what I was after, at time marker 4:30 and while the environment is a bit noisy as the guy is shooting it in a video arcade parlour, it is clear that the behaviour of the real game is just as I observed on the FPGA, at power on or after reset, the game is silent (unlike MAME!) and only after finishing the memory test and displaying the message "Initial tests indicate: operational" it emits a very brief sound before moving to the attract screen. Sorry about the suspended account this weekend. I was on vacation with the family and didn't notice until Sunday that the account was suspended. I don't know why there is not an option to automatically charge me for the forum. Seems like I've missed the manual payment a couple times but usually catch it pretty quickly. This time I was out on vacation so it was a much bigger deal than it normally is. On my task list, a call to the forum host to see why I can't do an automatic bill to avoid this type of thing. Update: They pointed me to an obscure area where I could enter a recurring billing account! So we should not see any more suspensions. Sorry to interrupt the thread. No problem Jack. So in case you all thought that now that the sound is working this was all over, think again. I'm here to torture you some more. Incidentally, is anyone reading these posts (other than RorschachUK and Vlait) and should I continue posting or should I just STFU and GTFO ? The game just hard hangs and I get a black picture and I have to reset it to get it back to life. Last time I investigated similar behaviour with Robotron it turned out to be a CPU bug in the handling of a HALT event, but now that this is fixed, what could be the issue? Is it still related to the blitter? Is it another CPU bug? Time to investigate. As before I patch address $E000 at the reset vector and the game just skips the lengthy hardware tests and initialization and jumps to the attract screen which is text only and displays the high scores, but we need it to just go the next attract screen with the logo. The disassembly at this location shortly after the game start address at $E000 shows the relevant part, X register is loaded with value $5ED0 which is the address of the code that displays the high scores. After some tracing and stepping though the code I determined that the code that displays the Joust logo just happens to live at address $D000 so I patched the location at $E0D8 to load the X register with $D000. 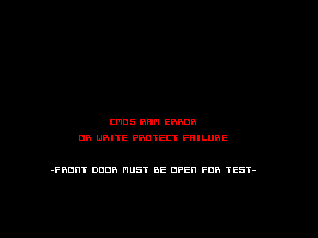 Now immediately after power on the game jumps directly to the problem screen. A rough explanation is that after about 300ms the CPU has finished the game initialization and enables the interrupts, which can be seen by the IRQ line starting to pulse (it means it has initialized the PIAs, which generate the interrupts). Another 100ms later the HALT line starts to become asserted meaning it has begun to use the blitter. Immediately apparent is that after some initial brief pulses on the HALT line, it then remains halted for extremely long times (for a CPU) almost 1/4 second at a time. This strikes me as abnormal behaviour that needs investigation, but since I spent most of the evening in the debugger finding patch locations, this will have to be continued... maybe. at first glance the sc chips are missing 2 functions, shift and sync to E clock for RAM-RAM copying - is the latter handled by the cpu handler ? If not that might well be causing problems. 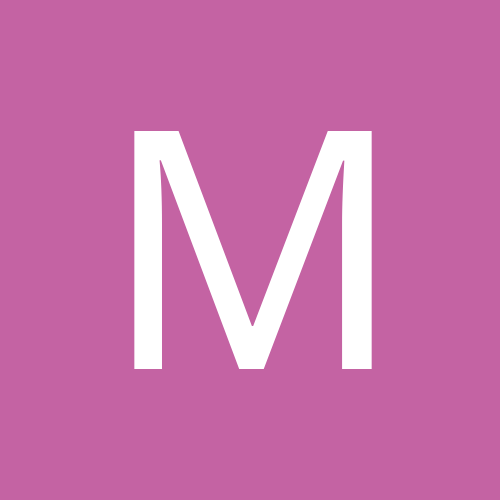 I think the very detailed account for how you go about to debug this code is extremely interesting to read, especially for more experienced users. There are very few articles on how to debug VHDL code out there, most tutorials are step-by-step instructions of how to make something but not what to do if your creation doesn't work as you expect. Also thanks Vlait, I had visited Sean Riddle's site and Jrok too just this weekend and came across those detailed tests, made for very interesting reading. If you could help out with these that would be awesome. I was a little sad (to say the least) that Jrok seems to have gotten all the Williams games to run on his custom FPGA board ( a Spartan 2 no less) but he has no downloadable code, grrrr. Jrok also uses an external 6809 just like Jared from Sharebrained so I wonder if he's just using a modified version of Jared's code or a completely independent implementation. I haven't seen any videos on Jrok's platform so not sure how playable all the games are or if they have any issues. I think you may be right that the SC VHDL implementation is incomplete, I think I'll have to check it against Sean Riddle's modified MAME C code on his site and update the VHDL. 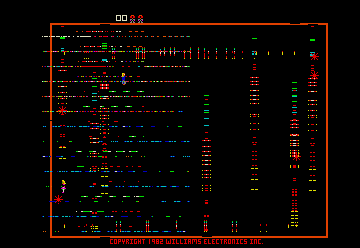 EDIT: OK sorted it, after observing that the SC registers on the FPGA were loaded with different values than I was seeing in MAME, I tracked down where those values were coming from and I arrived at the CMOS, then it struck me, I was initializing the CMOS with default values for Robotron! 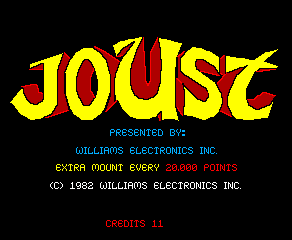 After I got a dump from MAME and initialized the CMOS with default values for Joust, it is now very happy all the way through. I decided that it'll be too hard to have different CMOS initialization values for each game so I'll just have a blank CMOS and let each game reset its settings on power on. This means on first boot the game will stop with a message that the CMOS was reset to factory defaults and the user has to press the "advance" button. At the moment the games that seem to play fine are Joust, Robotron and Stargate, the others are very sad. Of course Joust (and Robotron) are already use the monitor in 'landscape' mode, but might benefit from using a standard pixel clock. Changing line 196 to "if x_count_next >= width then"
and line 200 to "if y_count_next >= height then"
The LX45 has a total of 116 RAM blocks so you may be able to get away using 1/3 of them as frame buffer though if you're talking about the Pipistrello specifically, you should consider using the external DRAM for this particular purpose since the LX45 has an MCB and more importantly the frame buffer is accessed in a predictable sequential order which is ideal for getting high speed out of the DRAM. Extending this logic, you could use the DRAM controller you made recently on a LX9 even, though Bombjack specifically won't run an a LX9 due to memory requirements (not just size but speed). The other thing to consider is that if you change the pixel clock on the output relative to the pixel clock on the input the in/out video frames become unsynchronized so you may end up with unwanted video artifacts. Bubbles seems to be happy as long as height/width = 0 do not cause the blitter to run off (my earlier post). You can also advance from the "Factory Settings Restored" by pressing reset btw. Nice one Vlait, I hadn't thought of adding Splat ROMs. What changes did you to the the blitter? Do you just not run when h=0 and w=0 ? Also can you point me to a 6809 assembler? I tried a bunch of them and none are happy compiling jrok's test code.